I stay here quite frequently last summer, I was new and Owner and her granddaughter was very hopefully and kind to our family) thought it was family own business till met the new managers, VERY rude and cocky. It's not worth it if the customer service is no good to me that is. I enjoy camping and being outside and spending time with family. If you want that don't come here with the new management of this place. Sites are graveled some have a pad with the sites. More shady on river. Some of the "monthly sites " look trashy but I didn't look over there much. Walking area for pets. Have nice little playground and pavilion to have a gathering under. 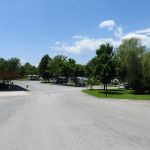 We camped at Ripplin Waters Campground in a Fifth Wheel. The staff was friendly, but the campground is not very well maintained. The grass immediately out our door was tall and needed to be cut. All the grass surrounding our site needed to be cut. Other areas that had been cut were full of dried grass clippings. As a result, taking pets out was messy. The sites are gravel, and ours was not level. This is a nice place for an overnight, but not longer. May be better if you have no pets. We camped at Ripplin Waters Campground in a Fifth Wheel. We had a water front site with nice grassy area. The office staff was friendly and helpful. The small store was well supplied. I would have given a higher rating but the location was very congested due to the main road construction. There was a constant problem of getting in and out of this park. We camped at Ripplin Waters Campground in a Motorhome. Lots of construction on road out front. It’s a real mess right now but should be much nicer when completed. When leaving you must turn right out of the campground and find someplace to make a U-Turn to get back to I-40. Lady in office was kind of sour and yelled at her son while registering us. Sites are cramped but fortunately the park wasn’t full so nobody was next to us. The full-time/seasonal sites are packed on top of each other and some are messy and dirty. Too steep to access river. Level sites, steady electric and water pressure. Small pool, looked clean but a long walk up hill from sites. Only one dumpster for the entire park which was also an uphill walk. 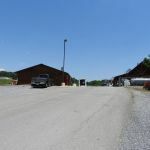 Good for an overnight stop off I-40 but too far out and too much traffic and construction to battle to make this a good place to stay if you plan to go to Pigeon Forge, Gatlinburg, Dollywood or other attractions. Think we would try another place next time. We camped at Ripplin Waters Campground in a Motorhome. Sites real nice and level.Staff nice and friendly. Bath house and rest rooms located up hill across from office they where all pretty clean but a long walk from the campsites. Wifi signal great, pool all ready closed. Awful entrance coming from Sevierville, had to go pass the campground and make a u turn, when we left we needed to go to 1-40, so had to go right and make a u turn, no crossover, really bad. 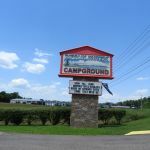 The campground is located to far away from any main attractions if you want to go to Pigeon Forge, Gatlinburg, and the National park. It's a terrible drive, just to far and the traffic is terrible. If you want to go to the Smokey Mts and just relax and not do nothing it would be a nice place to stay. From what I saw, the store was stocked with a limited supply of merchandise. I can not recommend staying here if you want to go to Dollywood or any shows, etc, as the drive will get you. We camped at Ripplin Waters Campground in a Motorhome.